A lightweight, easy-to-use cordless string trimmer that is also earth-friendly, the Earthwise CST00012 is best suited to small yards that require occasional light work. If you’re looking for something simple, no fuss, and easy to store in a garage, then this trimmer is right for you. The battery life per charge is limited, so it’s wise to start with the heaviest tasks first (when the charge is strongest) and finish up with the lighter work. 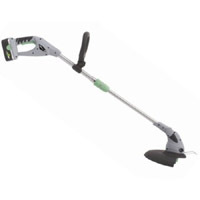 For a convenient lawn trimmer, this Earthwise model is attractively priced at $59.